Fourteen seamstresses were commissioned to design a parka to reflect their own heritage. If Inuit seamstresses are considered protective of their families’ sewing patterns, a new collection of traditional parkas set to go on sale could change that idea. A New York City studio drew a crowd to see the release of Canada Goose’s new social enterprise, Project Atigi, which features the work of 14 seamstresses from across Inuit Nunangat. Each woman drew from their own expertise and family history to craft their own parka, amauti or anorak using Canada Goose material, creating a new collection that’s set to go on sale internationally though the clothing manufacturer. One of the seamstresses, Jennifer Munick of Kuujjuaq, drew on two previous generations to create a girl’s red parka, using a pattern belonging to her late grandmother and the sewing skills she learned from her mother Martha Munick, another seamstress featured in the new collection. “Inuit women and girls, we were brought up sewing,” Munick says in a video presentation of Project Atigi. To do that, Munick, who is also chair of Kativik Regional Government, used one of her late grandmother’s patterns that the family accidentally uncovered to make a girl’s red parka. She added a floral skirt onto the jacket as a tribute to her anaanatsiaq. That parka, and 13 others, was on display at Studio 525 in New York City for the collection’s launch on Jan. 31. Eight of the 14 seamstresses attended the launch. In additional to parkas made by Jennifer and Martha Munick, the collection also features the work of Meeka Atagootak, Rebecca Killiktee, Winnifred Nungak, Freda Raddi, Marlene Watson, Mishael Gordon, Chantel Kablutsiak, Kristy King, Eileen Arragutainaq, Chantelle Andersen, Jackie King and Donna Dicker. Later this month, the Project Atigi collection will be showcased in Canada Goose stores around the world and will be made available for purchase at the company’s website. Canada Goose confirmed that the seamstresses retain the rights to their designs and the company will not be reproducing them. 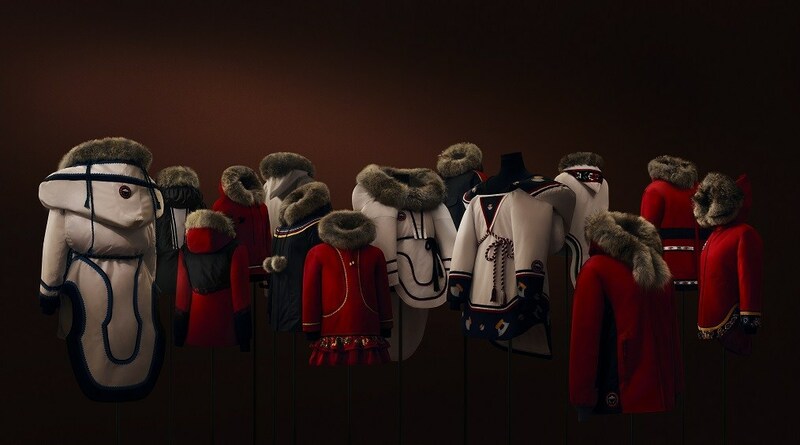 All of the proceeds from the sale of the parkas will go to Inuit Tapiriit Kanatami. You can read more about Project Atigi and see the story behind each parka here.